It’s been a longtime since Andrei hasn’t published an article for the Electrical Engineering Community Blog. Here’s his participation! 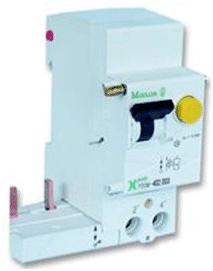 What is Residual Current Device & Residual Current Circuit Breaker and where to use it? Let’s read his article and remember that you can also publish debates, equipment reviews, articles, essays or testimonies/career stories. Just send us a mail. Modern day Electrical Power Distribution System require more protective measures than the conventional Circuit Breaker used against circuit overloads. The standard fuse many times proved to be too slow and/or not sensitive enough to prevent fire or electrocution. Let’s look at figure below. In (a) we have an RCD in series with our consumer M. In normal operating conditions the current flow path is the one depicted with the dotted loop. Imagine now that a person somehow makes contact with the hot wire (the cable’s isolation is destroyed on a small portion and it touches the metal chassis of the equipment), a portion of the current will flow through the person and ground back to the generator creating a second current flow path just like in (b). This will cause that the current flowing through L (hot) wire to be equal to the sum of current through N (neutral) wire and current flowing through ground. This difference in current between the L and N wires is detected by RCD and it will break the circuit if the difference is greater than it’s threshold value. 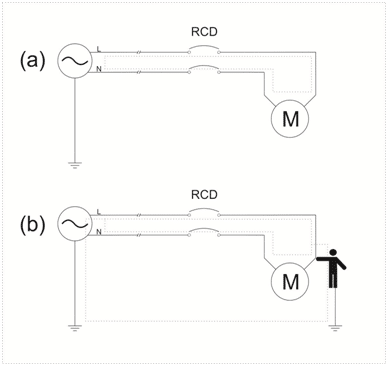 Threshold values for RCDs depend on the type of danger it is meant to prevent. For electrocution prevention the range is 5-30mA, for fire prevention is 100-1000mA and for high power equipment protection can be 3-30A. 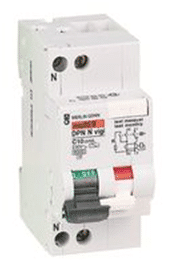 The most important aspect of any RCD is its very small response time. Once the current difference is greater than the threshold the circuit will break in less than 300ms for general purpose RCDs. These are usually marked with a G.
As you can see this kind of protection is not possible with a classic circuit breaker because it doesn’t have such high sensitivity and it is not that fast. In the market you will find individual RCDs like the Eton below. Most come equipped with a push button, yellow one in this case. It is a test button that will break the circuit and it is very useful when troubleshooting. Another important aspect is that all RCD will have contacts for both hot and neutral wires and 3 phase RCDs will have contacts for all phase wires and neutral. Other manufacturers incorporate a RCD with a normal circuit breaker MCB, something that is usually called RCBO (Residual Current Breaker with Overcurrent). An example is the Merlin Gerin 19665 that you can see below. In conclusion RCDs are essential in today’s electrical systems and offer increased protection for human life and equipment. They might give you a headache when installing such a breaker in old installations because of false tripping. It is important to have a good neutral line circuit with these devices, something which you don’t always find in older buildings, I’m sure you agree. Your impressions on this article? or copy this trackback: http://engineering.electrical-equipment.org/electrical-distribution/residual-current-device-circuit-breaker.html/trackback from your own site.